LF Accoyo Champ El Nino Son-Top 1+2%EPD! 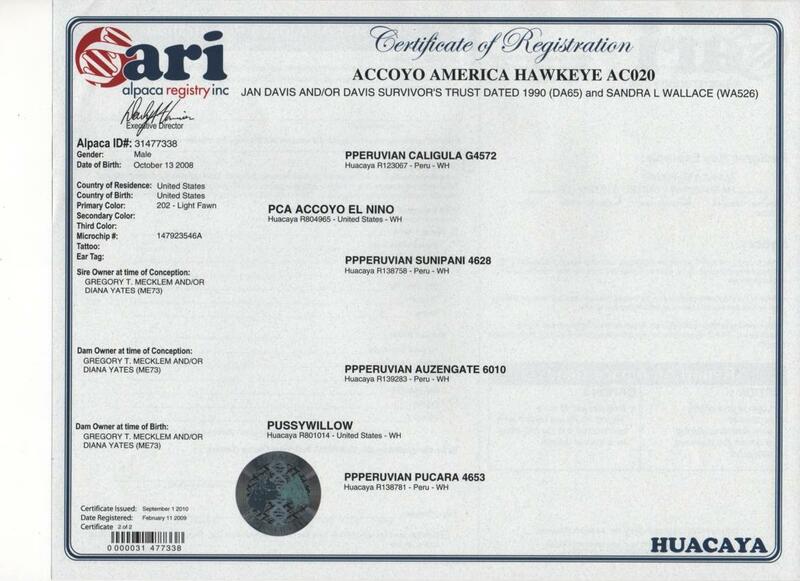 Accoyo America Hawkeye--it doesn't get any better! The legendary Accoyo El Nino perished in a blizzard, guarding his harem, but he has produced a line of famous and impressive offspring second to none. 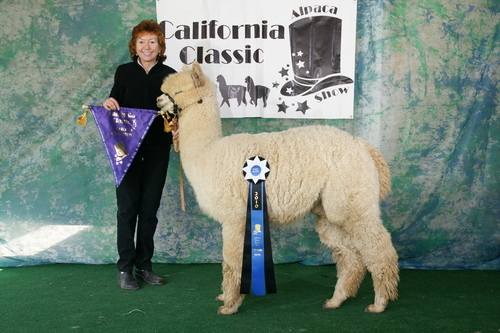 El Nino is revered for his prepotency in passing on outstanding characteristics of density, fleece architecture and crimp, and conformation to his cria. His sire was the incomparable Pperuvian Caligula, and his dam was the equally reknown Pperuvian Sunipani--both dam and sire imported from the original Peruvian Accoyo organization. Pussywillow is an outstanding Accoyo dam, producing some of Pacific Crest/Accoyo America's most illustrious alpacas, including Accoyo Polaris, Camilio's Accoyo Endurance, and Accoyo America Charlemagne. EPDs: Top FW and MSL!! Heads up if you want to improve your herd's fleece weight and staple length...! Hawkeye is probably the last full Accoyo fawn offspring of the legendary Accoyo El Nino, revered for his prepotency in passing his outstanding characteristics on to his offspring, and we expect no less from Hawkeye. Hawkeye's full brother, Accoyo Polaris, just sold for $100,000 at the 2012 Parade of Champions Auction! His dam, Pussywillow, was a Futurity champion with numerous illustrious offspring. El Nino was reknown for DENSITY, and he has passed this trait on to his son, Hawkeye. 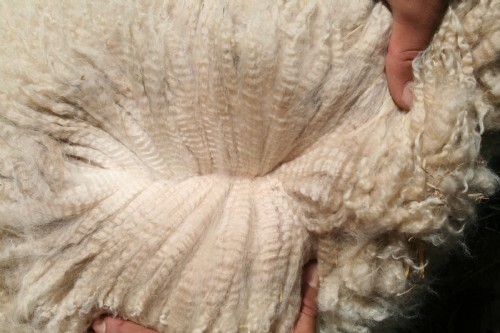 Hawkeye has outrageously crimping, bundling fleece, with that quality of "draping" that you only see with exceptionally dense fleece that has long staple length. Brightness? Look no further--Hawkeye's fleece will knock your socks off! And for a young male, Hawkeye has a "macho" conformation--solid with excellent bone, a level topline, and a classic Accoyo head, not to mention a perfect bite at 7 years of age! Hawkeye returned from his summer at the Firestone vineyards, and he looks MAGNIFICENT!! The new generation rises from the legacies of the great Accoyos El Nino, Caligula, Sunipani, Pussywillow, and Auzengate! When I look at Hawkeye, I am often reminded of his sire, Accoyo El Nino, and how he died outside in a winter storm, refusing to come into the barn because he was "protecting" his harem from the attentions of another herdsire (who happened to be his son!). Hawkeye looks just like his sire (in fawn), refusing to go out to the field to graze, preferring to "protect" his turf (although he rarely fights or spits--he's a very "benign" dictatior!). Hawkey's first cria, Mohican, took 3rd of 13 his first time out in the ring at the GWAS--he had barely turned 6 months of age. He is gorgeous--3 blue ribbons, and the spittin' image of his sire in white. Hawkeye also has a rose grey daughter who just took the Color Group banner (CC) at the California Classic. Hawkeye ws featured in the video on EPDs at the 2015 AOA Nationals, representing the top 1% for Fleece Weight. He is honored! 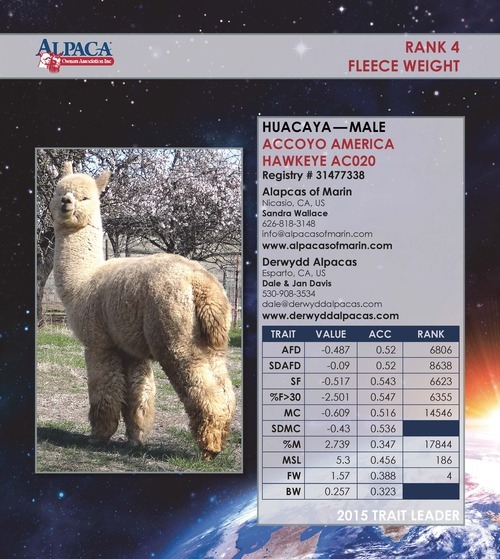 Hawkeye is co-owned with Jan and Dale Davis, of Derwydd Alpacas. He is enjoying the ocean breezes of Coastal Marin County north of San Francisco, at Alpacas of Marin. 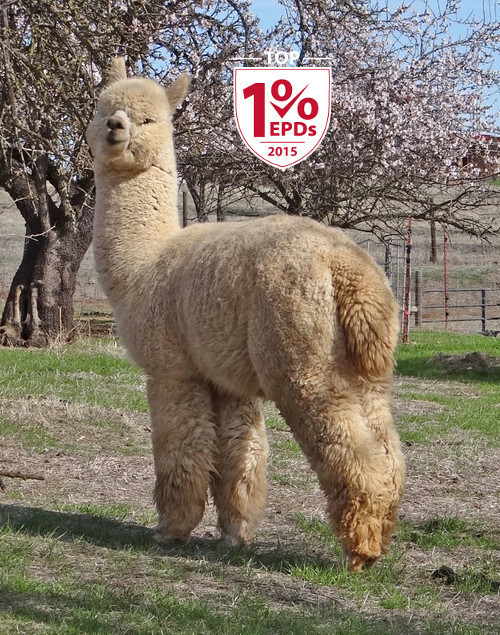 Hawkeye is in the top 1% of 2013 EPDs for Fleece Weight and top 2% for Staple Length! We can consider flexible financing. In general, we accept 1/3 down with 1 year interest-free to pay the balance. 1% EPD for 4 yrs--Bred to Matrix G'son! 3Blue Wins--Son of LF Accoyo Champ-EPDs! AFD is 16.4 at 2 years old!